Our heat exchangers are based on tried-and-true designs, but they are built to order and often include features unique to their installation. Use our interactive online form to get a fast and accurate quote! A leading food manufacturing company uses this heat exchanger in their research & development laboratory. It cools air passing through the 12″ x 36″ rectangular flange from 50 F to -80 F. Liquid nitrogen enters the top tube at -280 F, boils and superheats to -120 F before exiting the bottom tube. The air enters a single 6″ diameter pipe stub and exits (2) 4″ pipe stubs. A differential pressure gauge reports the pressure drop across the cooling fins. The air is used to cool blown plastic film. This aftercooler uses (2) 3 HP 24″ dia. 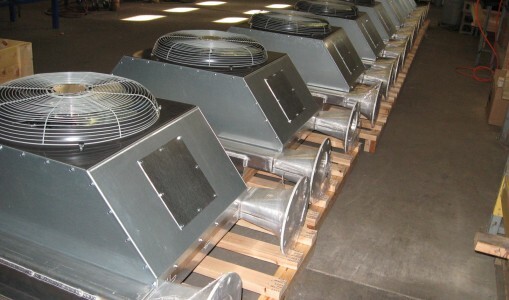 fans to cool a blower discharge stream of 3500 SCFM at 14 PSIG from 300 F to 122 F in a 95 F ambient. Blower air pressure loss is 0.1 PSI. 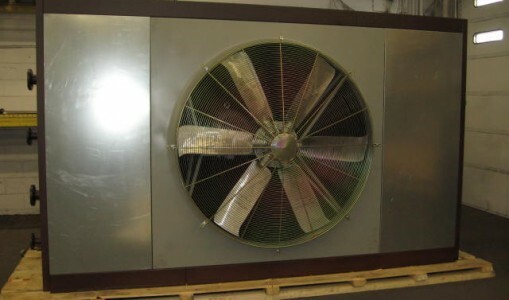 We offer 12 Volt DC and hydraulic fans for truck unload blower aftercoolers like this one. Cam Lock fittings enable the hose to be quickly attached & removed. Air enters the top of this heat exchanger and exits to the lower left. The core is coated with Heresite baked epoxy phenolic resin for corrosion resistance. The filter pack mates to a fresh-air duct at the plant. The filters easily removed (3 hand knobs) through the side. Steam heats the air to the desired temperature using a thermostatic temperature control valve. The configuration of this AA-1000 saved a lot of space. It’s aftercooling a coal power plant’s hydrated lime conveying blower. This 2 two stage heat exchanger cools, dehumidifies & reheats compressed landfill gas. The dampers on this AA-1750 enable software controls to keep it from freezing condensate during operation on even the windiest Minnesota winter days. The exchanger first filters, then cools & dehumidifies and finally it reheats and distributes air to four points-of-use in a candy manufacturing plant. Service is from chilled water and steam. This heat exchanger heats cold argon gas using steam. Five independent steam circuits provide a high degree of control over the temperature of the heated air and also redundancy. This heater is constructed entirely from inconel, which is a high-performance alloy and is very resistant to corrosion. These two heat exchangers cool hot, humid gas from a landfill or digester blower. Using chilled glycol coolant and 460 volt power for the fan, this unit delivers gas at 70 F and 50% relative humidity. The fan blows vertically up from underneath this compressor aftercooling heat exchanger which is designed for 100 PSI air pressure.The flanges are 150 lb ANSI type, the motor is explosion proof with an aluminum non-sparking propeller. Teflon is not only slippery, it is very impervious to attack from a variety of corrosive chemicals. The powder blue color of this heat exchanger is one of many colors available, including warm colors such as brown and red.The housing of this heat exchanger is coated with Teflon, which is resistant to many corrosive chemicals. Teflon is often an economical alternative to stainless steel or exotic metal construction. Note the new super strong, low cost conical transitions (pat. pending). The unit was pressure tested at 75 PSIG. It’s cold and the air is thin at 40,000 feet …if your airliner ingested a flock of high-flying water foul in cruise and all engines were ground to a halt, the captain would certainly find joy in seeing the ship’s Auxiliary Power Unit or APU spring to life. The APU is a turbine engine electricity generator, it can provide power for the flight controls, navigation and other systems. Without it, that flight deck wouldn’t have pilots, just more passengers.It’s not cheap to conduct APU systems testing in an unpressurized plane 7 miles above the nearest donut shop …doing this kind of work in style calls for a custom heat exchanger that can recreate the stratosphere right in your test lab. Such is the case with the specialized little monster, with it’s twin air inlets, multiple camera ports and most importantly a massive nitrogen evaporator that chills air down to -60 C, even when it’s at a low pressure of 1/4 of an atmosphere. This water cooled heat exchanger cools charge air for an stationary electric generator engine for a hospital in Saudi Arabia. The tubes are copper and the shell is hot-dip galvanized steel, with 4″ ANSI flanges. With a flow of 15 gallons per minute of 80 degree F water, this unit cools 480 SCFM air from 395 degrees F to 100 degrees F.
This fan cooled heat exchanger cools lube oil for a gas drilling rig in the Arctic Circle. The tubes are rated for 400 PSIG and carry an ASME Stamp. The motor is a 480 volt, explosion proof with a CE Stamp and a non-sparking aluminum fan blade. The entire assembly is registered with a Canadian Registration Number (CRN). Air cooling heat exchanger with offset transitions provides a custom fit for a lucky plastics manufacturer. The carbon steel shell encloses a copper tube, aluminum fin heat exchanger. Water circulates in the tubes and blower discharge air passes in the shell’s 18″ ANSI flanged inlet on the left, through the fins and exits the other side.Length is 15′ 6″. Blowers that draw gas from landfill wells exhaust at 13 PSIG into this stainless steel tube, aluminum fin heat exchanger. The gas is cooled from 250 F to 200 F in a gas-to-gas primary heat exchanger, then it’s cooled to 50 deg F by 40 F glycol and before it exits, this gas heats up to 100 F by cooling the inlet gas stream (on the other side of the gas-to-gas exchanger).The heat exchanger allows an internal combustion engine to burn the landfill gas to generate electricity. This stainless steel tube, aluminum fin heat exchanger cools water from 150 deg F to 100 deg F using ambient air driven by a two 10 HP, 5′ 6″ diameter electric motor driven fans.It’s attached to a rig that is drilling wells to capture coal seam methane. The hot water makes four passes in the heat exchanger core, entering in the bottom 3″ 150 lb. ANSI flange and exiting through the top. This aluminum heat exchanger cools ISO VG 65 lube oil from 200 deg F to 150 deg F using ambient air driven by a 1 HP electric motor driven fan. It’s used in by a paper manufacturing company, cooling the lube oil lube oil on a paper line. Pressure drop on the oil is under 5 PSI.The lube oil makes two passes in the heat exchanger core, entering in the top 1.5″ 150 lb. ANSI flange and exiting through the bottom. This stainless steel heat exchanger cools air from 70 deg F to -150 deg F using liquid nitrogen. It’s used in by a food manufacturing company, in their test facility.The nitrogen evaporates at -280 deg F inside the 1/2″ O.D. copper tubes. The air flows vertically downward through the heat exchanger. The air connections are 2″ tri-clover ferrules. This air cooled blower aftercooler has a custom access panel on the hood and one for the core itself. Simply removing eight bolts gives installers and maintenance personnel access to the motor and electrical wiring or the internal (blower air) passages of the core.This heat exchanger also has a special heavy-duty venturi frame, which is capable of handling cast-frame 3 HP motor. The two heat exchangers cores of this landfill gas blower aftercooler are manifolded to provide a single 10″ diameter flange inlet and outlet.The hot gas enters the top horizontal manifold from the upper right and exits from the bottom nozzle which is perpendicular to the inlet. Two cooling fans draft ambient air horizontally across the heat exchanger cores. The strength and low cost conical heat exchanger combined with a simple bolt flange allow access by removing the core or transition.With the removal of a few bolts, the transition can be demounted. This heat exchanger was pressure tested at 50 PSIG. The phenolic coating extends the life of this heat exchanger by years when in service with landfill gas. When cleaning is necessary, the bolted headers can easily be removed to access the internal passages. 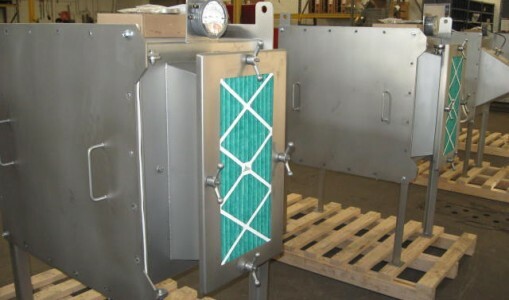 This air cooled heat exchanger has an epoxy phenolic coated core, which can be accessed for cleaning by removing the bolted header access panel. 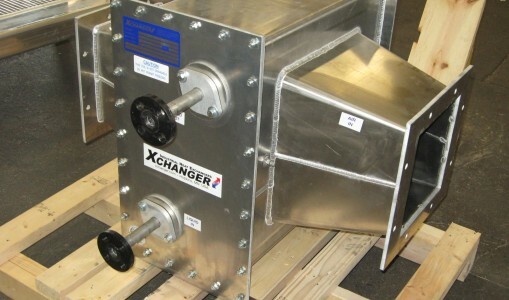 Using proprietary optimization software, engineers at Xchanger quickly and accurately select lowest-cost heat exchanger design options from hundreds of design options.A Pressure Swing Adsorption (PSA) air separation plant is using this heat exchanger to cool it’s process air/gas stream. For the sorbent material to separate air into it’s constituents (nitrogen and oxygen), the pressure is cycled every 30 seconds from 10 PSIG to 0 PSIG. Because of the frequent pressure cycling, the heat exchanger has to be built ultra-heavy-duty. Pressure cycling is so severe that a equipment designed for indefinite life under normal operation will likely fail in months. Using proprietary stress analysis software, engineers at Xchanger are able to quickly and accurately predict the stress and deflection in hundreds of heat exchanger design combinations under varying load conditions. This software helps Xchanger engineers avoid tedious steps in the design stage, allowing their attention to be focused on the bigger picture. This prevents costly over-building and disastrous under-building. The heat exchanger pictured is being used to cool a 10,150 SCFM air/gas stream from 222ºF to 90ºF using 85ºF water from a cooling tower. Using chilled water, steam, and filters, this heat exchanger does three jobs at once.A problem common in pneumatic conveying systems is that as the conveying air is compressed it’s temperature increases about 15 ºF per PSI. The compression also increases the air’s dew point temperature by about 2ºF per PSI. Hot, humid conveying air can cause certain conveyed products to melt and form clumps. A simple solution to these problems is a two stage heat exchanger that cools and dehumidifies the conveying air. 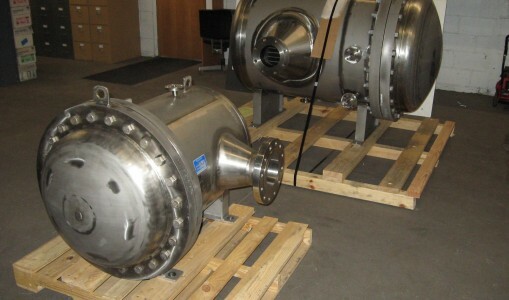 This two-stage heat exchanger is used by a pharmaceutical manufacturer to cool, dehumidify and filter air on the discharge of a pneumatic conveying blower. Air travels from left to right. The first heat exchanger stage uses 45ºF chilled water to cool and dehumidify the 2,280 SCFM, 4 PSIG air flow from 145ºF to 55ºF. The air, then at 100% RH passes through a mist eliminator to ensure no condensate droplets carry downstream. The second heat exchanger stage uses steam to heat air back to 95ºF, where it is at 23% RH. This heating stage lowers the relative humidity to prevent moisture gain in the pneumatically conveyed powder. The third heat exchanger stage houses a pre-filter and HEPA (high-efficiency particle arresting) filter, which keep the air stream clean. 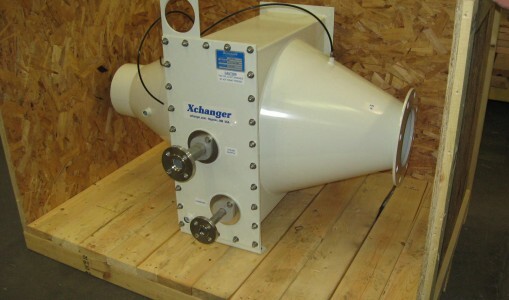 This exchanger is built to 3A-dairy standards. The filter can be accessed and replaced without tools. The first two stages are made from carbon steel, which is hot-dip galvanized. The third stage, which must have a mirror finish downstream of the filter, is made from stainless steel. Xchanger units are in use worldwide in food, chemical, plastics, pharmaceutical, pollution and other industries. As the smallest, lowest-cost AA Series heat exchanger, this special model fills the need for a low-cost cooler for flows less than 300 SCFM. Nominally rated for 250 SCFM, this new heat exchanger is an economical cooler for smaller air flows. It is typically capable of cooling hot air streams to within 15ºF of ambient, with a pressure drop under 0.3 PSI. Air cooled heat exchangers can be practical alternative to liquid cooled exchangers. They are usually less costly to install, requiring only wiring, as opposed to coolant supply & return lines. The core in Xchanger’s AA Series heat exchangers consists of 100’s of separate alternating horizontal and vertical channels. The process airstream flows through the horizontal channels and is cooled by ambient air that’s pulled through the vertical channels by an electric fan. The free-flowing design of the core minimizes pressure loss and their extra-large surface area enables compact units to perform substantial heat transfer duties. In a typical installation, the process airstream can be brought to within 15ºF. of ambient air with a 0.25 PSI pressure loss. Temperature drops of 300ºF to 400ºF are common. Heat exchangers are available for air flows to 3,500 SCFM and for pressures from full vacuum to 50 PSIG. Using a cooling tower water circuit upstream of a chilled water circuit, this heat exchanger drastically reduces the use of costly refrigerated cooling water.This Xchanger two-stage heat exchanger with a twist was custom designed to fit a tight space in the corner of a chemical plant. It is used to cool the discharge of a pneumatic conveying blower on a plastic pellet system. The two-stage heat exchanger minimizes the use of chilled water for cooling, thus reducing energy and maintenance costs. Electric power savings for this design is over $15,000/year. 54% of the heat load is rejected in the 1st stage, to inexpensive cooling tower water. This minimizes the use of the more costly chilled water in the 2nd stage. Combined, the two-stages are cooling a 4500 SCFM gas/air flow at 12 PSIG from 200ºF to 50ºF. Using vent condensers, pollution problems can be solved while reclaiming product that would be lost to evaporation.Condensing vapors at storage tank and reactors vents is an economical way to control many VOC emissions. Depending on the chemicals and temperatures involved, over 85% recovery is possible. Condensers have low capital and operating costs, they don’t require costly permits, and they don’t create toxic chemical by-products, unlike some competing technologies. And unlike flares, incinerators or carbon beds, condensate can be reclaimed and reused. TV Series condensers are available for flows to 5,000+ SCFM and pressure from full vacuum to 50 PSIG. Designs are compact, lightweight and pressure drop is minimal, usually less than 0.02 PSI. Cooling water, glycol, refrigerants or cryogenic fluids such as liquid nitrogen can be used as coolant. Fin/tube cores can be removed for inspection or cleaning without disassembly of vent line. Soil remediation often involves pressure blowers pulling vapors from the ground and pushing them through a carbon bed. A heat exchanger placed after the blower can maximize the efficiency of the carbon bed.AA Series heat exchangers use fan-forced ambient air to cool process air streams. They’re designed for outdoor service and are available with a wide range of motor and air connection size/type options. A common application of these air cooled heat exchangers is in soil vapor extraction, where steam is injected into the ground while a vacuum blower pulls the steam, laden with VOCs out of the ground. The steam/air/VOC stream is then blown into carbon beds, which adsorb the harmful chemicals. As the vapor stream passes through the blower, it’s temperature often increases from 50ºF to 200ºF, due to the heat of compression. Placed after the blower, AA Series coolers improve the performance of carbon beds by cooling their inlet stream. AA Series heat exchangers are designed to operate with a minimum pressure loss, usually under 0.1 PSI. They are generally capable of cooling the hot air stream (nearly regardless of inlet temperature) to within 15ºF of the ambient air temperature. Air flows to 3,500 SCFM and pressures to 50 PSIG can be accommodated in standard models. Using calibrated measuring equipment, Xchanger engineers gather data used to validate and extend the company’s performance rating software.Xchanger’s test facility is located at the corporate headquarters in Hopkins, Minnesota. The purpose of the test facility is primarily to verify engineering methods and procedures. 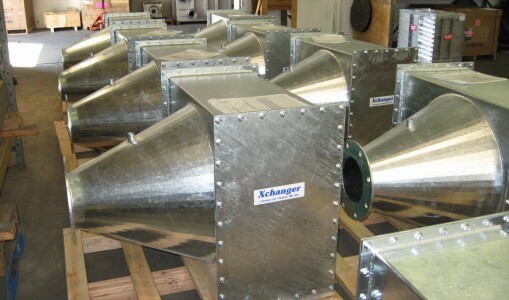 As the company’s products are built to order, without the luxury of prototyping each unique heat exchanger, it is crucial that Xchanger engineers know how a heat exchanger is going to function before it is built. Tests are used to validate predictions for thermal and pressure drop performance, as well as mechanical strength. During this test of a liquid nitrogen cooled vent condenser, Xchanger engineers are collecting frost growth data. This information will be used to fine tune the company’s software that is used to make performance predictions. During pressure tests, slight deflection is measured with sensitive dial indicators and strain gauges. By comparing the amount of deflection to the predictions, design methods can be fine tuned. Testing assures that Xchanger units will perform in the field as rated. It is a critical element in ensuring the accuracy of predictions for heat transfer, pressure drop and mechanical integrity. These ASME design HP Series heat exchangers are made from aluminum for a plastics manufacturer in Texas. HP Series heat exchangers can be used to heat or cool an air stream with very little pressure loss and can ASME code stamped. Housings designed for gas pressure to 50 PSI and flows to 9,000 SCFM are available. Low (5″ WC) drop leads to significant economies in power consumption. The heat exchangers pictured will be used to cool a 4,000 SCFM pneumatic conveying airstream from 230ºF to 125ºF with 90ºF cooling water. These heat exchangers will prevent the plastic pellets being conveyed from melting and clogging conveying lines. They are designed to the ASME code for 25 PSIG internal pressure. This air cooled blower aftercooler has a custom access panel on the hood. Simply removing eight bolts gives installers and maintenance personnel access to the motor and electrical wiring.This unit also have a special heavy-duty venturi frame, which is capable of handling cast-frame 50 Hz 143T motors that are typically used in pneumatic conveying systems in Singapore. The heat exchanger core is made from aluminum. With it’s epoxy phenolic coated cores, heated condensate pans and steam injection system, this heat exchanger is built to handle viscous, sticky condensate. This heat exchanger cools 24,000 SCFM from 210ºF to 124ºF. A water flow of 180 gallons/minute at 87ºF keeps it cool. At room temperature the oil is a solid, at 124ºF it flows like pancake syrup. Pans below each rack of cores are heated to prevent condensate solidification and insure drainage. The pans are heated with water at 130ºF. To keep it clean, the exchanger is fitted with steam injection ports. Steam is injected into the fins to clean out any residual oil on an automatic cycle when the process is not running. The water circulates inside the heat exchanger’s copper tubes, which are finned on the nitrogen side with aluminum. The housing is type 304 stainless steel and includes man-holes on both sides. For even more thorough cleaning, the fin/tube cores can be removed though the bolted access panels. 4. Free-flowing Heat Exchanger Saves $50,000/Year! Lower pressure drop translates to lower power consumption and higher profits for the food company that operates this heat exchanger. 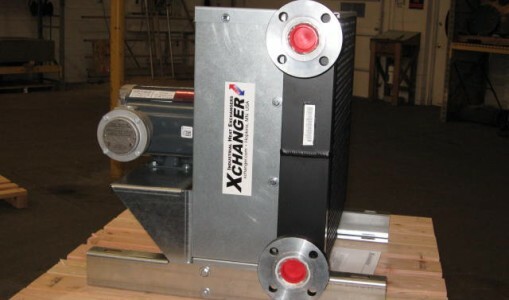 Xchanger’s extended-surface heat exchangers offer cost savings in “pumping power” compared to more restrictive primary-surface heat exchangers of similar cost. The 1/10 PSI drop compares to 2 PSI for a comparably priced shell & tube. The higher pressure-loss could increase pumping-power costs $50,000/year. Other key advantages of extended-surface heat exchangers is that they provide the same amount of heat transfer with a smaller unit-size than primary-surface designs and can be economically designed to separate condensate as it forms, eliminating the need for a special down-stream separator. The HP-60 has a 60 inch diameter cylindrical housing designed to ASME code for 45 PSIG gas pressure. It is pressure tested at 75 PSIG. 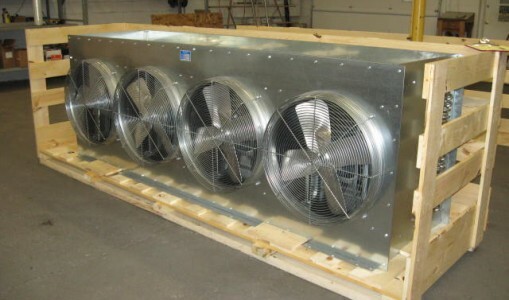 This unit is used to cool 25,000 SCFM air at 45 PSIG from 230ºF to 85ºF. Cooling water at 80ºF flows through the unit at 125 GPM. Not the largest heat exchanger made at Xchanger, but it’s in the that group. This condenser is designed for a 5 PSIG internal nitrogen pressure.An Xchanger engineer stands next to one of the companies custom designed heat exchangers. The unit has just completed final pressure and quality control tests and is ready for shipment to a customer in the chemical industry. It weighs 15,000 lbs. and has a shell manufactured of stainless steel. Our design allows for a maximum pressure loss of 5 inches water column, a flow of 27,000 SCFM nitrogen and a maximum nitrogen temperature of 440ºF. It will be used in a closed-loop, 24 hour batch processing operation to heat and cool a 3 PSIG nitrogen gas stream. The heating fluid being used is Dowtherm® oil. 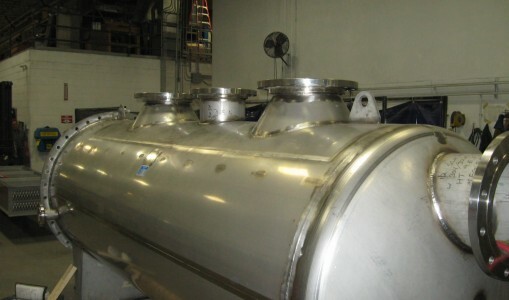 Using finned tubing, Xchanger’s TV Series vent condensers have a tremendous cost and performance advantages over primary surface condensers, such as shell & tube, plate & frame and spirals.TV Series heat exchangers are used to condense vapors in a low pressure gas stream, typically from storage tank or reactor vents. Common applications include chemical process systems, product recovery and pollution control. Industries served include: chemical, hydrocarbon processing, plastics and pharmaceutical. Process gas flows from to 5,000 SCFM are common. Coolant can be water, glycol, brine, refrigerant or liquid nitrogen. With 3 independent circuits, this custom design heat exchanger with one motor driven fan is able to cool the discharge air and lube oil from an air compressor, and at the same time it heats nitrogen gas from a liquid nitrogen vaporizer. This LC Series heat exchanger uses a 48 inch diameter, 3 HP fan to blow 15,000 CFM of 90ºF ambient cooling air vertically up through it’s three-circuit fin-tube core.The largest of the three circuits is for cooling the compressed air (2,000 SCFM at 100 PSIG from 210ºF to 120ºF). Another circuit provides cooling for the compressor oil (9 GPM from 160ºF to 130ºF). A third circuit superheats nitrogen gas from an evaporator (200 SCFM at 120 PSIG from -200ºF to 40ºF). This three-circuit heat exchanger replaced three separate heat exchangers that were originally specified for these duties. In doing so, it simplified up-front engineering and reduced capital costs. This design, with it’s unique 3-in-1 capability, also yielded significant savings in the installation, maintenance, operation costs.